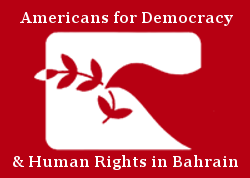 Americans for Democracy & Human Rights in Bahrain (ADHRB), along with the Bahrain Institute for Rights & Democracy (BIRD) invite individuals and organizations around the world to show their support for Bahraini human rights defender Nabeel Rajab and his family by sharing a photo of themselves holding a poster of Nabeel or a message of solidarity. At approximately 5:00 AM (GMT+3) on 13 June 2016, Bahraini police, led by the Cybercrime Unit, surrounded Nabeel Rajab’s home. At 6:12 AM, Rajab’s son Adam tweeted: “Police entered the house and arrested my father Nabeel Rajab.” On Tuesday 14 June, the Government of Bahrain charged Nabeel with “publishing and broadcasting false news that undermines the prestige of the state” and detained him for seven days. On 21 June 2016, the Government of Bahrain extended his detention for another eight days. On 26 June 2016, the Bahraini government informed Nabeel that his case regarding comments Nabeel made about Jaw prison and Yemen war was being referred to the High Criminal Court for trial. Nabeel’s first hearing was scheduled for 12 July 2016 but authorities postponed his trial to 2 August 2016. Nabeel may face up to 13 years of imprisonment if convicted in that case. Since the 2011 Arab Spring, the Government of Bahrain has targeted Nabeel Rajab, the President of the Bahrain Center for Human Rights, numerous times. Bahraini authorities arrested Nabeel repeatedly in 2012. Between 2012 and 2014, Nabeel served two years in prison on charges of organizing unauthorized protests. Following an advocacy trip in Europe and his participation in the 27th Session of the United Nations Human Rights Commission (UNHRC), police arrested Nabeel in October 2014 and charged him with insulting the army in a tweet. The Government of Bahrain sentenced Nabeel to six-month imprisonment and a travel ban. He was released on bail during the appeal of the sentence. In April 2015, police detained Nabeel for tweets he made regarding the Central Jau Prison administration and war in Yemen. Nabeel was held in police custody until June 2015, when he received a royal pardon during Ramadan for his six-month sentence. The Government of Bahrain continue to enforce his travel ban and did not drop his previous charges. Our aim is to get a total of 500 images and/or videos of solidarity, a hundred for every year since 2011. Please share your photo, ideally with details of where it was taken (i.e. White House, Washington DC, USA) with us before 2 August 2016. We will compile all images and clips into a video to highlight the international support for Nabeel Rajab and his ongoing efforts to achieve human rights for all in Bahrain.